If you fall off the diet wagon frequently and can’t commit to a life of clean, albeit bland, food, you need to make a trip to Galleria market’s newbie. We’ve got some rather juicy news – Crudo Juicery is now serving cold-pressed juices, smoothies, salads, yogurts and pastas in Gurgaon. What does this mean for you and your 2017 fitness resolutions? Such good things! It’s still soup season, so make sure you warm up to health at Crudo. We’ve heard good things about their very green broccoli, spinach and kale soup. If you’re in the mood for a quick brekkie fix, try some of their yogurt variants – crunchy muesli optional. 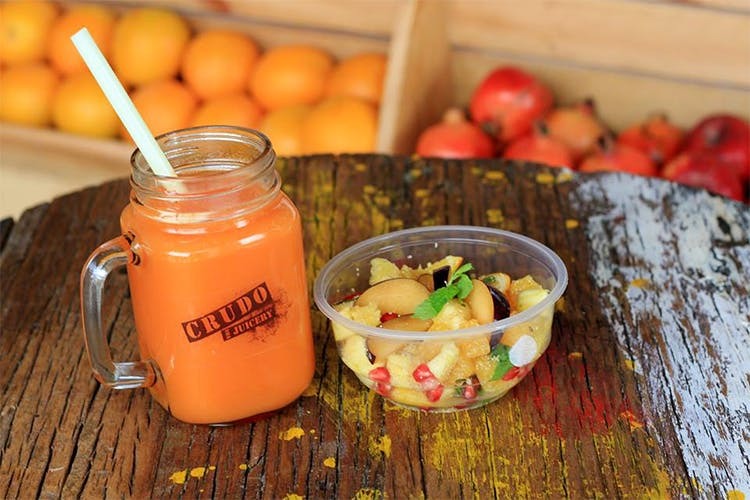 We well and truly understand the struggle to keep our diets in check, so we’re very excited by new-on-the-food-scene Crudo Juicery. From wheatgrass shots to pesto salads, there’s something for every caloric requirement. Here’s to slaying all your body goals!